Our Priest Fraternity has as its fundamental structure the small community of priests (5 or 6 brothers) who meet once a month and who intend to live the fraternal life not only on prayer days but in various ways throughout the month and with other local fraternities of the region and country. 2.1 How do you try in your country to strengthen fraternal bonds within the local fraternity and with other fraternities in the region and country? 2.2 Is there on-going communication between local fraternities? What means are utilized? 2.3 Do fraternities accompany one another to remain faithful to appropriate methods of spiritual growth? How? 2.4 What coordinating structures do local fraternities have with each region in the country? 2.5 How does the regional level encourage the meetings of local fraternities? 2.6 What roles do the National Responsible and Regional Responsibles play? As diocesan priests, inspired with the charism of Br. Charles, we know that our mission is the evangelization of those most abandoned and distant from the Christian faith, principally through our style of life and our witness. “Apostolate of generosity,” “Cry the Gospel with our lives,” as Blessed Charles said. 3.1 In what ways are we working with the theme of our style of life as priest in our country? To what conclusions have we come? 3.2 In what ways are we working with the theme of our manner of doing pastoral work? To what conclusions have we come? 3.3 Following the orientation of Pope Francis to the “geographic and existential peripheries” are we reaching our evangelizing mission? How are we doing it? What helps and difficulties have we encountered? 3.4 Could we say that the fraternities of our country have made a ‘preferential option’ for the poor and their struggles, understanding that there are diverse forms of poverty? What are concrete signs of this option? 3.5 Do we have some kind of ecumenical or interreligious dialog in our countries? 4.1 We know that the charism of Br. 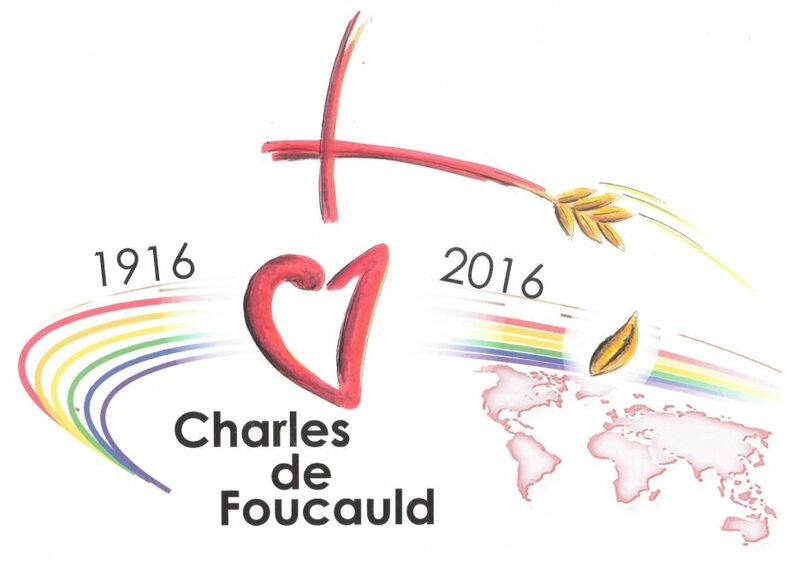 Charles is shared by laity and religious and with whom we form what is called the Family of Charles de Foucauld. In our country are there ties to this Family? Which? How have they functioned? What successes have we had? 4.2 We also have awareness of belonging to a Priestly Fraternity that is in various countries. What connections do we maintain with other countries? What connections with the International Council? 4.3 As diocesan priests we belong to a presbyterate. Do we have presence, participation and input to our presbyterate? Mention some significant examples. 4.4 As a Priestly Fraternity, recognized by the Holy See, we have an institutional presence in each country. Do we have some connection with the Conference of Bishops? What kind? We are convinced that the charism of Brother Charles has made the Church better and will continue making it so in the measure that all the members of the Foucauldian Family are faithful to this charism. For this reason we are interested not only in the spiritual growth of our Fraternity but also numerical growth. 5.1 In what way has our Priestly Fraternity become known by other priests in our dioceses? 5.2 What perception do they have of our Fraternity, especially the youngest priests? 5.3 Has there been some opportunities to get to know seminarians and their formators? What results have we had? 5.4 What follow-up has been made to priests or seminarians who have shown some interest in knowing us better and eventually being integrated to our Fraternity? 5.5 Does the Fraternity have some definite policy to incorporate the priests who have made the decision to join us and to accompany them into a new local fraternity? I ask you to send your reports before October 15 in three languages (English, Spanish and French), in order to have as objective a vision as possible of what is happening in the fraternities of our countries. Thus I can forward them to the participants for study. I also ask you to bring to the Assembly a Presentation in Power Point of the most significant aspects of Life and Mission of our Fraternities. Each representative will have a maximum of 20 minutes to share. Many thanks for the reception you gave me in each moment and place, in Montreal and in Quebec. I found myself among a living fraternity of brothers who love and support each other, at their age, but with a real and committed spirit of Nazareth. Many thanks. Donald CLICHE took on the role of my older brother and cared for me “as he would a nuncio”. 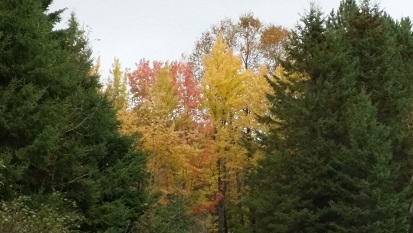 His house in Cap Rouge, Québec, surrounded by squirrels, afforded me the chance to contemplate and enjoy the natural surroundings, and to take a walk on my last day through the maple woods in full Autumn. It was a gift from God to meet Guy BOUILLÉ, on the morning of the 3rd of October, in hospital palliative care in Montreal, and to bless and be blessed silently by him, in company with Laurent RAVENDA and Jean-Pierre LANGLOIS. 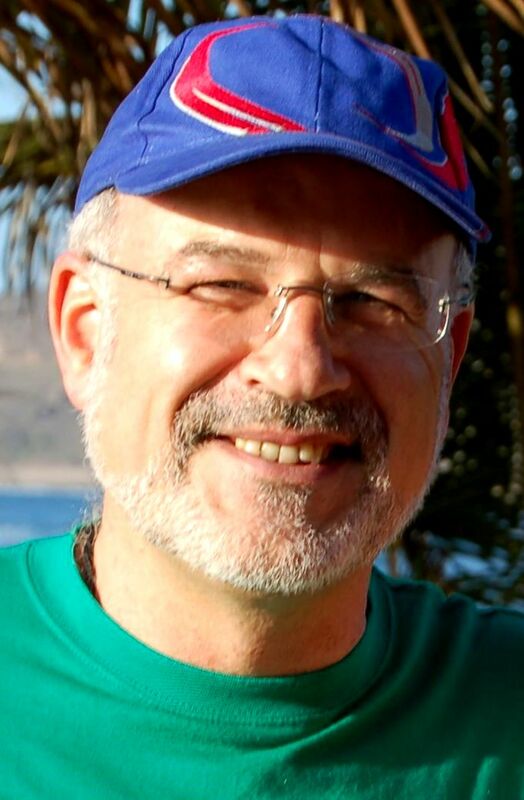 A few hours later he was already with the Lord in fraternity in the House of the Father with so many brothers who have departed us; I believe that he will have received the strongest embrace from Jacques LECLERC, his great brother and friend. I enjoyed the human affairs, hopes, encounters, with each brother, with the lay fraternity composed mainly of pastoral agents – thanks to Ciro, that fraternity’s responsible –, in the Montreal COPAM, (Communauté de Partage et d’AMitié) sharing each one’s present moment, each history, touched by the hand of the Lord, who leads us sometimes to where we do not wish to go, but who takes care of all. 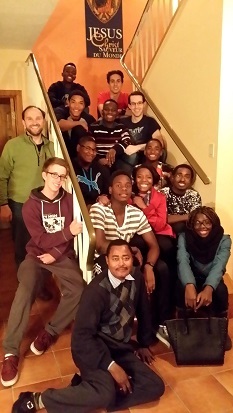 A good meeting also with the fraternity of young Christians which Ciro animates, with his spirit of accompaniment and of encouragement, a group made up mainly of immigrants, open to the call of Jesus in the building up of their lives, with a future and a joy that evokes a new world. The community supper and prayer, related to the Sunday Gospel, reminded me of Jesus gathering his disciples, instructing them to build up the Kingdom, with a profundity, despite the superficialities proposed by a First World of comfort and wealth. 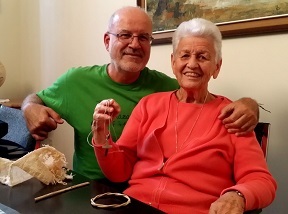 Another unexpected gift, which filled me with joy and emotion, was to meet with Sister Gilberte, of the Montreal Sisters of Notre Dame, who with Gianantonio ALLEGRI, of our Italian Fraternity, and Giampaolo MARTA, both missionaries of the diocese of Vicenza, was abducted last year by Boko Haram in the north of Cameroon. Yvonne, a pastoral agent, took me to the Notre Dame House of Prayer in Longueil, and for me it was moving to embrace this woman of the Gospel, to hear her testimony of the love of God throughout her 57 days of captivity with Gianantonio and Gian Paolo and to discover anew a real and not idealised Brother Charles, in the nothingness, without church candles or religious images to which we give devotion. Spending some time with Guy and Gilberte were the most memorable moments of my time with the fraternities of Quebec – Acadia, and for this I thank the Lord from my poor heart. 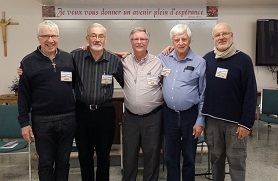 Our regional Fraternity meeting of 4th and 5th October in Quebec, with brothers and lay women pastoral agents, united to the Fraternity, was an encounter of brothers and sisters with an admirable spirit of service, with testimonies and a joie de vivre which strengthened me in the hope of a Church such as desired by Pope Francis. The outgoing trio of responsibles made up of Donald CLICHE – regional responsible, Benoît HINS y Richard WALLOT, gave way to Gilles BARIL, the new responsible, who will form a team with Jean-Claude DEMEURS, a great communication specialist, a woman pastoral worker and two other brothers whom he will choose. Thanks to all for your service to the Fraternity. The previous trio gave a good account of their time and of the life of the fraternities, and the air was filled with a spirit of brothers who, as humans and men of God, are a richness for the local churches. The dialogue, adoration, Eucharist, the moments of brotherly sharing were a true faith encounter. Among decisions and immediate proposals I would highlight the preparation for the next Month of Nazareth in January and the participation in the First Pan-american Assembly in Cuernavaca, Mexico, in February. Gilles y Donald will represent the region of Québec – Acadia. 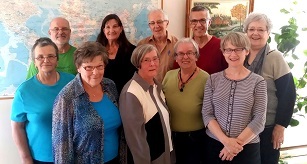 I accompanied Donald in Quebec visiting René TESSIER, a brother of the fraternity, and diocesan responsible for communication, Gaetan PROULX, auxiliary bishop, and Marc PELCHAT, vicar general, both of the fraternity, who invited us to lunch. 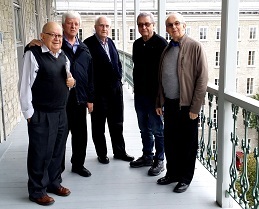 It was a joy also to meet up at the major seminary with the fraternity made up of Pierre GAUDETTE, Jacques GOURDE, Roger LABBÉ and Marc BOUCHARD, brothers who have an important track-record in their service to the Church, to the poorest and to the Fraternity. Thanks for your testimonies. For all this, for all we lived and shared, for the cries of the charism of Charles de FOUCAULD, with his message of universal brotherhood so valid for our Church today, so appreciated by Pope Francis, thanks, brothers, and thanks to God for allowing me witness of your life of fraternity for these days. I thank also Laurent for his providing a space for adoration, and in which I understood that spirituality goes beyond saying prayers, adoration, contemplation and sharing with others in liturgical celebrations. Spirituality is also a good sense of humour, joyfulness, solidarity, respect, giving attention, when we do anything, working, relating to others, travelling, listening, preparing an activity etc. For this reason it is important to give priority to the monthly Day in the Desert. God seeks us out in the desert to give us good spirit. 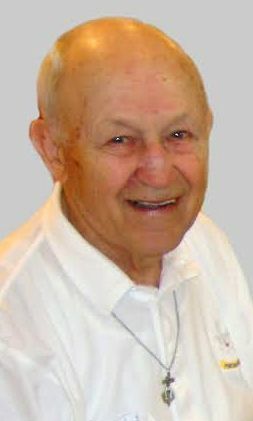 This good spirit is what Brother Charles put on when he prayed, wrote, dreamt or felt close to the people he lived among: the spirit of Nazareth. The never-ending invasion of refugees is provoking challenges to Europe. It is estimated that 800 000 people, declared the German Homeminister, will take refuge in Germany this year. This is a challenge, admits Angela Merkel, which is more difficult to deal with than the Euro or Greek crisis. We all, observes Pope Francis, live in “a common house”, which is near to collapse. What has caused that sudden invasion and migration of millions of people? What’s wrong? What needs to change? It is manifest that we in Germany and all Europeans are being challenged as national communities and as a continent. Politicians feel helpless not able to offer a solution of the turbulence. State Bureaucracies are overburdened and the great number of volunteers are reaching limits in dealing properly with the incoming refugees. Particularly alarming is that there are frequently fire attacks on refugee homes. Pick-up fights are accumulating. Social peace in our country is at stake and we have neither answer or remedy to the plight of the greatly suffering refugees seeking shelter country. The causes of mass flight are very different: War, terror and persecution on the one side – poverty, corruption and unemployment on the other side. To many refugees we are bound to grant asylum: our Constitution and our Mitmenschlichkeit (fellow beings solidarity) require to commit ourselves to the refugees in their distastrous calamities. Armutsflüchtlinge (poverty refugees), mainly from the Balkans are not counted as asylum seekers, there is no law to assist them legally. But their sufferings and human needs are also enormous. One thing is certain: as long as in the Middle East – in Syria with more than 250 000 war victims, in Iraq, in Libya, violence, killings and war are continuing…, as long as in Africa people and nations are suffering under state terror, anarchy and oppression – as long asin East-Europe people do not find work and food due to , corruption and state mismanagement…, so long there will be hundreds of thousands of people fleeing to Europe, especially to Germany to rescue their lives and to seek refuge. Ursachenbekämpfung (cause combat) are required – and it is truly required. But state and private development and economic aid for poor countries, although necessary, have usually impact only after many years – or not at all, when millions of dollars or euros are disappearing in the pockets of the ruling class. Peace initiatives are even more urgent as well as conflict mediation, if only the United Nations or other institutions would have the required authority and functioning structures. Probably – sad enough – a lot of blood will flow, until from the tragic Middle East power struggle aiming at access to econoic ressources peaceful solutions will emerge. In the meantime, terrorists in gisguise of religion and fanatic extremists are continuing to commit satanic atrocities. It is worrying that at the beginning of the Afghanistan and Iraq war there were about a hundred terrorists, while today, hundreds of thousands of terrorists are threatening international peace by destroying uncountable lives. Greed and claim to powers of Western states mingled with the fatal arch-enmity between Shia and Sunni Muslims have nationally and internationally led to the tragedy from which countless people try to escape at any cost. Ursachenbekämpfung (cause combat) is called for, but it is easy to claim for it it by words…. Needs for us in Germany are the updating of the German asylum law, the fast provision of an immigration law mainly for Europaeans and to pass an almost utopian agreement towards an European asylum law. The despair of the refugees, social peace in European countries and the realisation ot the European vision of human dignity and freedom, justice and peace are enormous challenges of the present. A lot has to change. But peacemaking and combating poverty require much, too much time. Statesmen and women, economic enterpreneurs and civic individuals with a lot of courage, common sense and creativity are required. The longings of people to leave in peace, justice and freedom are ineffaceable and unending. But as long as weapons are not put buried, as long as economic exploitation and oppression are continuing and as long as people are threatened and arbitrarily killed or do not find food or work…, so long millions will flee and escape their killers and oppressors. Germany so far has accepted in Europe next to Sweden and Austria most of the refugees. The dreamland of many people is Germany. We have not deserved such a high regard. Refugees hope – utopia or not – to receive some of the advantages and achievements of the German postwar society such as prosperity, social and legal security, freedom, human rights and social justice, functioning (with little corruption) economic and political system. What has to change nowadays? What can not go on as it was going on? We cannot satisfy ourselves instead of learning and re-thinking our attidue towards live and our living standards, our global responsibilities, our intercultural and interreligious relations so as to live together peacefully with anyone, with the own people and with people of different ethnicities, cultures and religions. It is about to live together in a changed context and envirmonment. We need all in all to deepen and reconfirm our ethical, cultural and spiritual values as base for our live-together. In relationg to the refugees it is urgent that volunteers and civic groups and non-government organisations are being heard by power centered politicians and overformalized bureaucracies. I did appeal to the regional government to reply to five years pending asylum applications of pending of Afghan and Iranian refugees; I have protested against the deportation of a seriously sick youngster from Kosovo. Whenever we fail to challenge inhumanely acting administrations we try again and again. If everything fails hope will prevail. What can you do? Each one can contribute to the public debate with fair and reflected arguments to shun black-white labels and friend-enemy patterns. Racist slogans and xenophobic emotions can be rejected with peaceful means. The Churches in our country should not get tired, to challenge themselves and their communities to be open to refugees by creative means and to grow into solidarity with them. In religious ceremonies and social activites refugees should be included giving them priority. With the invasion of refugees our faith, our culture, our humanity are at stake.